Whilst being a Catholic School and therefore distinctive in our Faith commitment, we work very hard to be part of the wider Nailsea community. 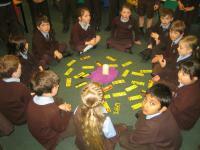 The headteacher and staff work with and attend regular meetings with local cluster and Catholic schools. 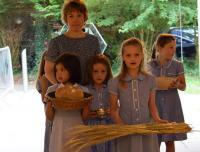 The school enjoys strong and close links with both its parishes, with clergy playing an active role in school life. 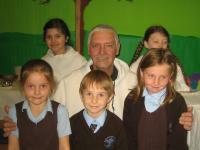 Children regularly visit St Francis Church, a walk away from school, and our Franciscan friars from Clevedon make regular visits to the school. 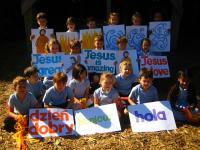 We enjoy a special relationship with St. Bede’s Catholic College in Bristol, where it is hoped that children from our two local parishes will attend when they leave aged eleven. We also enjoy strong links with the local secondary schools and pupils attend a number of functions ranging from sport to music festivals and science. 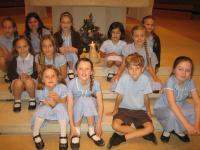 The children take part in sporting competitions with other schools in the area. 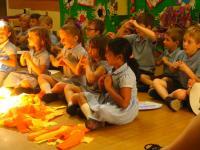 Music festivals take place in Nailsea for Year 2 and lower KS2. We also celebrate in song and dance at the county-wide MAWS concert held at the Colston Hall each March, the Dance Festival at the Playhouse in Weston super Mare, and the Catholic Primary Choir Concert at St Bede's College. We are pleased to receive visits from the Police and Fire Brigade. 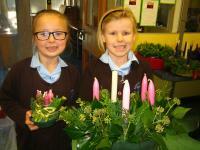 We enjoy our high profile and status within the wider community and will continue to be an open, welcoming school. St Francis' is a Catholic primary within the Diocese of Clifton and is one of three Catholic primaries in North Somerset. Our feeder secondary school is St Bede's Catholic College, a beacon school with Science and PE as its specialisms. The College caters for pupils from 11-18 years and continues the work established at primary school for a broad and balanced education, enhanced throughout with the values of the Catholic faith. There exists excellent liaison between our schools and children achieve the highest of standards. Parents of children at St Francis' are warmly encouraged to visit St Bede's Catholic College and St Brendan's Sixth Form College when considering an upper school or sixth form education. St Bede's, enjoys excellent results year on year. 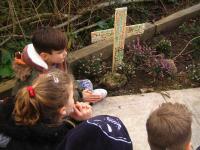 Further details of our Catholic Schools are available from the school office.